Last Saturday morning was gloriously calm and slow. I was cooking up some late-morning pancakes when the phone rang. Now, I knew there was a possibility of me getting a dog returned but I had hoped that it wouldn't be for a few more weeks since they had to take her to the shot clinic first to get the shots up to date. So, I answer the phone and it's the people with the dog asking when it is a good time to meet. Ok, might as well get it over with. I told them to call me after the shots since that can take hours at the cheap clinic and then we would meet at the dog park. I brought my dog, Toto, because he enjoys car rides and we picked up Sadie, the puppy I adopted out 5 years ago. I also got the rest of the story. The guy had been married when he adopted her but since got divorced and remarried, has a 1 yr old and his wife is pregnant again. Sadie, being a high energy dog, wasn't tolerated well by the new wife. I can empathize but there are things one can do to keep an energetic dog occupied. They just take time and patience. 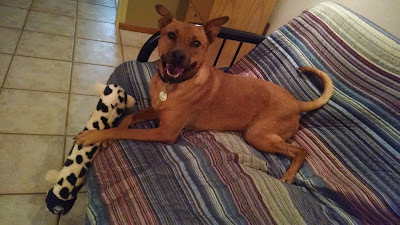 So, now I get to do those things to keep an energetic dog occupied until we can find her a new family. Trainers say to tire out a dog, they need physical and mental activity. First off, I don't run. I also like to sleep in. This dog likes to run and likes to get up early. I've been getting up at 6am and taking her and Toto for a walk. It's only 15 minutes or so but it's a huge accomplishment for me and the dogs like it. Then we practice her sit, down, shake. I go off to work and hope she behaves. She isn't a big chewer and hasn't destroyed anything, much to my relief. When I come home, I take the 3 slow dogs for a short walk and then exchange them for Toto and Sadie and we go on a longer walk. I throw the ball around the back yard and then put her in her crate at 8pm with something to chew on like a bully stick or Kong toy filled with kibble and peanut butter. It's worked so far and she has even been staying quiet in her crate until I go get her at 6:30am although I need to get up earlier than that to not be late to work. I would really like to be able to hitch her to a cart and have her pull me around but carts are too expensive and I don't have the time to design my own. 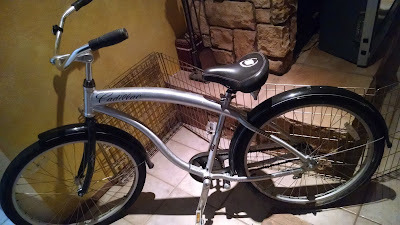 So, I borrowed a bike from a friend and bought a leash attachment bar for $15 on Ebay to keep her away from the wheels. The attachment will be delivered on Saturday and I hope it works. I would love to be able to get enough speed on the bike for her to run. Ok, enough about the dog, even though that's been my main focus all week. Today is my birthday. 45 years old and I am not retired yet or semi-retired. I am still at my same job that is "meh", but gives me adequate money. My new retirement goal is still 2-3 years away although I really like the security that comes with knowing that I could survive if I quit my job today. I want to do more than merely survive though so I will keep working towards that goal. In return for postponing your early retirement, you have greatly improved your quality of life. It wasn't that long ago that you were dealing with water shortages and other water issues all the time. You also began taking care of your nephew and have had some uncertainties with your tenants at your rental house (mostly resolved, we hope?). With all of that, your ER goal remains well within reach although you won't be able to claim "I retired at 45" like I did. That's okay, you and all of us followers of your trek will be happy to celebrate it with you, whenever it occurs! Count me in as a "follower of your trek," as Dave (fellow follower, say that three times fast) puts it. And apropos the milestone today along the way, happy birthday with blessings attached. Early retirement or not, you have an incredible amount of energy -- I don't know where you get it from, but would love to know your secret! Happy Birthday - the additional exercise will be good for you. Trust me (from someone almost 15 years older)! I am so surprised that someone would be ale to find your contact information after 5 year to return the dog. Daizy, you haven't updated your home mortgage progress on the sidebar since December. Yes, it has been quite a journey so far with many twists and turns. More adventures to come, I am sure. Thank you, philo! It certainly is a trek. One more step closer the financial security. Naps, or the pursuit of naps, that is my secret. Lol. I was surprised too! They even found my name. I don't know if I would have recognized the dog if they hadn't of told me that I had her as a puppy. Good news is that she is calming down in the house. We still need to work on car rides. She's a nervous wreck. It is a very nice position to be in especially with all the changes going g on at work. I know, it's not as fun to update it without the large deposits I was making.